Doctrine.fr is a legal search engine which allows to search in the French legal data, read court decisions, legislation, commentaries and receive legal news. Our backend has been entirely implemented in Node.js for 3 years. Most of the search engine load relies on external components, that are called asynchronously by our backend code, which perfectly suits the Node.js architecture. Nevertheless, for historical reasons, some of this code still contains long synchronous operations. It was therefore mandatory for us to detect these long synchronous hotspots, in order to eliminate them. We will introduce this presentation by describing the problem with long synchronous operations in Node.js. After that we will talk about our analysis method and its results, which allowed us to make hypotheses that drove our success fixing the most important hotspots. We call this approach the traditional framework model. This figure shows that most threads are suspended waiting for a response. A synchronous operation is an operation where the thread is not suspended. In the figure above, the call and respond operations are synchronous. Having synchronous operations is inevitable and normal. Most synchronous operations are short. In this figure, we see that the thread is monopolized by the first request, and the Node.js engine is not able to serve the second request until the long synchronous operation finishes. The warning threshold was set to 1 second. It appeared that we had more than 300 synchronous operations per day with a duration above 1 second. We had removed the most flagrant long synchronous operations long ago, hence we knew that the remaining ones would probably be looking like harmless pieces of code, for instance a simple loop, whose actual performance is in fact dramatically impacted by the size of the user input. Our codebase is large and complex, so we needed a way to detect these synchronous hotspots. When a monster operation, with a duration above 1 second, occurs, our monitoring system may consider Node.js as unresponsive, in which case it would kill and restart the server, by that losing all the currently processed requests. For the user, this would amount to an application crash. The very slow operations have a visible impact on the user experience, by slowing down the whole server, and give a feeling of sluggishness. Priority tasks are simple tasks, that cannot afford to be slow; the most prominent example is the autocomplete feature, which proposes completion while the user is typing. This feature is only useful if the completions come as fast as the user types, which needs a backend time of less than 40 ms, an impossible goal if a slow synchronous operation (10 to 100 ms) is monopolizing the execution thread. We deem acceptable operations between 1 ms and 10 ms, if they are not too frequent, and we consider fast a duration below 1 ms (actually, this class is itself divided in multiple subclasses that we will not describe further). As discussed above, we knew that we had more than 300 monster operations per day, which may seem a lot, but is in fact an anecdotical percentage of the whole set of queries, and these monsters can be traced back to various infrastructure glitches and edge cases. On the other hand, we did not know anything about the other classes. In particular, we had no information about the very slow, slow and medium classes. In order to analyze synchronous operation, we created a module that encapsulates async_hooks. The module instantiates a simple map, in order to store information about each async call started. As described in their documentation, init and destroy callbacks are called when a class is constructed (respectively, destroyed), that has the possibility of emitting an asynchronous event. The init function simply creates a tracking object in the map, the key being the asyncId of the call. Note that it is mandatory to remove this object from the map in destroy, to avoid memory leaks. The object associated to this asyncId is first fetched, then the start date is stored, in the form of a high-resolution timer, which is far more accurate than using a Date object, and whose precision gets down to the nanosecond. The start time is retrieved from the map, based on the asyncId, and the elapsed time is calculated. A reportSyncTimeCallback module variable (which is declared elsewhere in the module, with a setter) contains a callback to report various information on the call (including other data than those related to duration calculation). Storing only the counts, rather than the durations themselves, ensures a constant storage size. If we look at the class 100 ms - 1 s, we notice that there is a 5% percent chance that a request hits a long synchronous operation of this class. Most notably, the autocomplete feature is a priority task whose performance is tightly monitored. Prior measurements exhibited a 95th percentile of autocomplete at about 100ms. 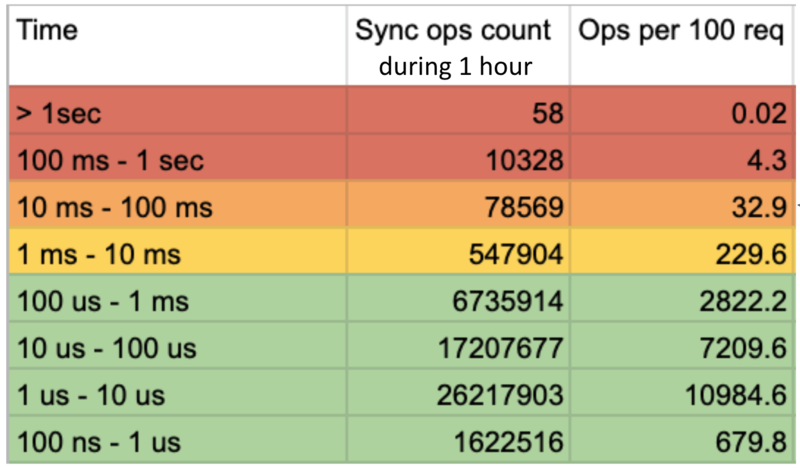 Considering the above 5% probability for a request to hit a 100 ms - 1 sec long synchronous operation, we hypothesized that the 5% of autocomplete that were above 100 ms were all caused by synchronous operations. Solving this priority task problem was therefore a strong motivator to find and resolve these long synchronous operations. Both of these graphs span two weeks, between Monday, February 25th, 2019 and Friday, March 8th, 2019. 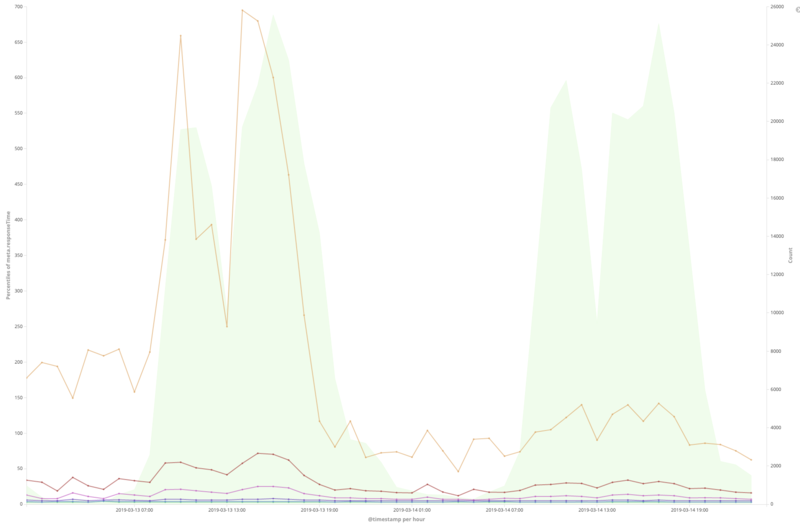 The flat part in the middle of the graph is a weekend, where the traffic on Doctrine.fr reaches a low point. At this point, we knew that there were an important number of long synchronous operations, that we were able to classify by their durations. Nevertheless, we needed to find the exact hotspots in the code that exhibited these synchronous calls. Searching for these hotspots required to be far more intrusive in the code, which excluded performing this search on the production platform. Hence, before going further, we first assessed whether the development platform exhibited the same distribution as the production platform. As you can see, the distribution was similar enough between the two platforms for the remaining work on the development platform to be meaningful. We then parsed the profiler logs to spot the synchronous operations. To do this, we wrote the analyzeLongSyncOpsInProfilingData tool, that we open-sourced in the Doctrine open-source github repository. The number of distinct call stacks, which is a quick discriminator between functions being part of a hot path (low distinct call stack count - optimizing the function would only provide gain for a small number of paths in the code) and functions being hotspots (high distinct call stack count - optimizing the function will have an impact on several different code paths). With these information, it was straightforward to know what the hotspots were, and what was their impact. We proceeded to fix some of the detected long synchronous operations. Each codebase is different, but some common lessons may be derived from our investigations. We decided to focus only on a sample of the top-ranking functions, namely the ones linked to our search engine query analysis, because we felt that optimizing them would bring quick rewards. All the functions linked to HTML parsing are based on more complex algorithms, that would be more complicated to optimize. All of these query analysis functions look for specific patterns in the user input (the search query), for instance to identify jurisdictions or law articles. Therefore, they all have similar structures: They are loops on large sets of regular expressions. Of course, the longer the user input, the higher the regular expression search duration, and therefore the longer the overall loop duration. These functions perfectly fit the traditional framework model, since executing them in a dedicated thread would not disturb the other queries. In a Node.js framework, they are anti-patterns, executing long synchronous code that monopolize the main thread. The simplest approach to tackle these synchronous hotspots was to target optimizations at the loop level (rather than, for instance, trying to use Node.js worker threads). Note the use of setImmediate, to release the main thread at each loop iteration. There are several options to release the queue in Node.js (setTimeout and process.nextTick), but setImmediate is executed when all the other callbacks have been executed (to be precise, when the poll phase becomes idle), which is exactly the best way to let other queries be handled by the main thread in Node.js. 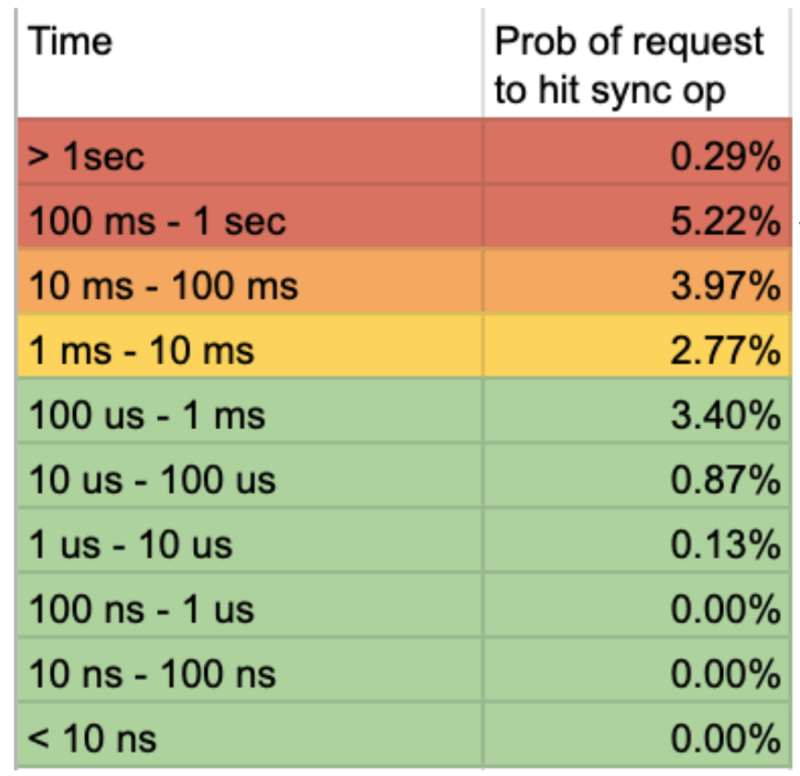 Unfortunately, after implementing this approach, we noticed that the performance penalty was huge: The async loop was 15% slower than the synchronous version, which was unacceptable. Worse, this performance penalty was measured without other queries running, which means it was only linked to the cost of scheduling the next loop iteration. We took a forthright route to try overcoming this problem, by adding a mechanism to call setImmediate only on each N loop iterations. Depending on the functions, we concluded that calling setImmediate every two or three iterations would drop the asynchronous performance tax to 5%. The left hand-side of the graph is the number of synchronous operations of this class during the day of March 13th. The modification has been pushed to production in the late afternoon of this same day. We clearly see that, on March 14th, the number of synchronous operations has been divided by 2. This indicates that the synchronous operations we modified has moved below the 10 ms threshold, thereby slipping in our medium and fast classes. We see that the autocomplete response time, at the P95 level (the orange line) has dramatically dropped, and, furthermore, is now only marginally impacted by the number of requests (the green background), which was not the case before. This validates our hypothesis that the 5% of slow autocomplete queries were entirely linked to long synchronous operations. 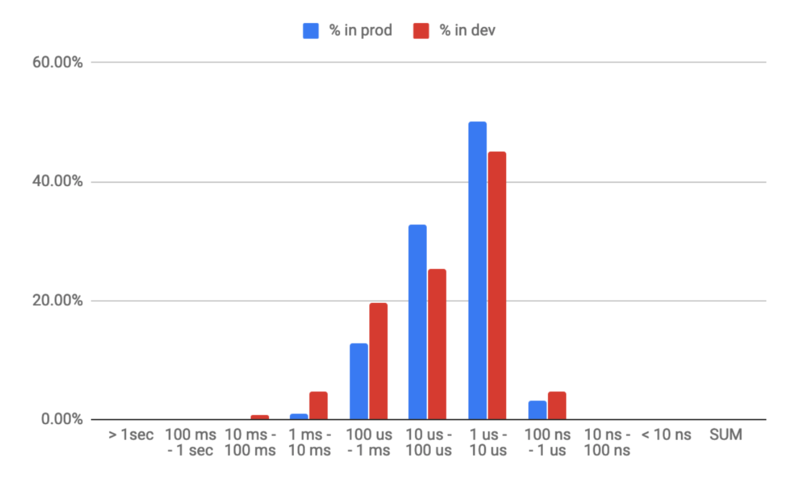 We showed how we analyzed the synchronous hotspots in our code with async hooks, and how we fixed them. The results on the application performance, and on the behavior of the priority tasks, proves our approach is sound and meaningful. We still have synchronous hotspots to tackle, and we first favored an ad-hoc fix that we were able to release early. Since then, we have been iterating on this solution, by setting up a framework that will automatically break long synchronous operations when they reach a certain threshold.